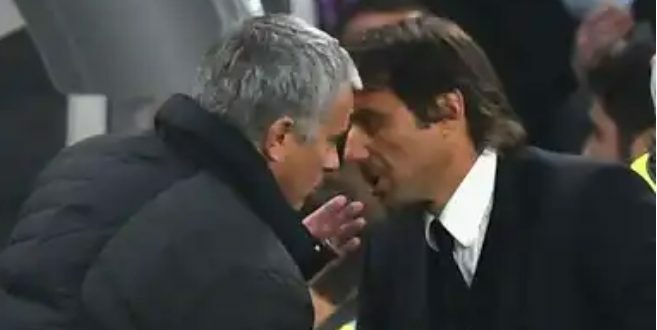 Antonio Conte and Jose Mourinho will come face-to-face for the first time since their bitter war of words erupted last month when Manchester United host Chelsea at Old Trafford on Sunday. 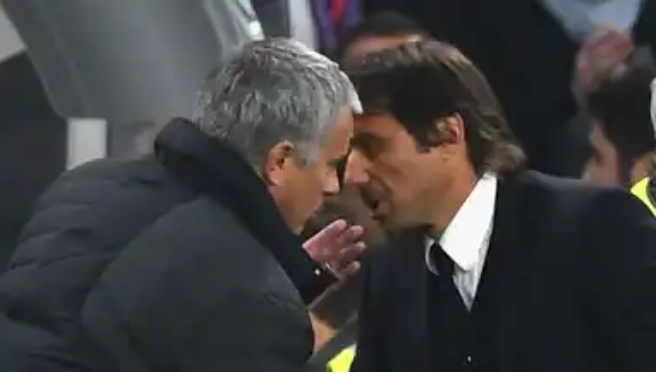 Tensions had simmered between the pair since Conte’s appointment as Mourinho’s long-term successor at Stamford Bridge in 2016, with the Portuguese’s proximity as a direct rival at United never likely to encourage detente. Here, we have a look back what both men said and how the row rapidly escalated. Last season’s jibes, as Chelsea marched to the Premier League title and United collected the EFL Cup and Europa League to compensate for a sixth-place finish in the top flight, amounted to a sparring, as opposed to an all-out verbal scrap. The seeds were sown when Mourinho complained to Conte about his animated celebrations on the touchine – more on those later – as Chelsea thrashed United 4-0 at Stamford Bridge in October 2016. Mourinho’s favoured method of damning with faint praise was to the fore last February, when he labelled the Premier League’s leading side “a very food defensive team”, while Conte warned Chelsea to avoid “the Mourinho season” this time around – a handy shorthand for the perils of a dreadful title defence, such as the one endured at Stamford Bridge in 2015-16. By last October, Mourinho suggested Conte was one of his rivals who, “they cry, they cry, they cry when a player is injured”. In the Italian’s opinion, the United boss was overly concerned with matters at his former club. The stage was set. While offering assurances over his United future on January 4, having appeared increasingly morose around matches, Mourinho identified an aspect of his behaviour he believes sets him apart from his colleagues. “Because I don’t behave as a clown on the touchline it means I lost my passion?” he said. “I prefer to behave the way I am doing it, much more mature, better for my team and myself. Mourinho could arguably have been referencing Conte, Pep Guardiola or Jurgen Klopp. All three men were asked about his comments; only one took the bait. Speaking a day later on January 5, Conte was quick to accuse Mourinho of hypocrisy in a rather eye-catching manner. “I think that he has to see himself in the past, maybe he was speaking about himself in the past, yeah?” he said. Despite the literal translation being “senile dementia”, Chelsea were forced to clarify Conte had been searching for the Italian word for “amnesia”. Either way, this was now an argument in the gutter. Mourinho seemed happy with that state of affairs and was determined to hit Conte where it hurt most. “Look, I don’t blame him. Honestly, I don’t blame him,” he began. There followed apparent contrition for past indiscretions. It was all an elaborate set-up. “The only thing I want to say to end the story is that yes, I made mistakes in the past on the touchline,” Mourinho added. Conte was implicated in a 2011 scandal while in charge of Siena and later served a four-month ban, but always denied any wrongdoing and was acquitted by an Italian judge in May 2016. Conte had spoken previously about his personal ordeal throughout the match-fixing affair. Following Chelsea’s 0-0 FA Cup draw at Norwich City on January 6, he was understandably in a barely concealed fury. “I consider him a little man, I consider him a man with a very low profile,” Conte said of Mourinho, before airing a recently learned word. Conte went on to lambast Mourinho for his criticism of Claudio Ranieri before last season seeking to show solidarity with the deposed Leicester City boss. “I remember for example, a stupid example with Ranieri, when he offended Ranieri for [the standard of] his English,” Conte seethed. “Then when Ranieri was sacked he put on a shirt for Ranieri. You are a fake. In the days following FA Cup third-round weekend, Conte underlined that he had “no regrets” over the episode. “He said serious words and used serious words. I won’t forget this,” he said. Mourinho then told reporters in no uncertain terms that he had “contempt” for Conte, as a dubious means to draw a line under the issue. All eyes on the dugout, then, at Old Trafford this weekend – a prospect Conte was already eyeing as he glowered at Carrow Road. Manchester United begin to see worrying version of Alexis Sanchez that Arsenal fans witnessed before January move . I feel Chelsea would defeat United.. What are your thoughts?